Thank you for your interest in holding in a Memorial Event/Activity. There is no singular way to commemorate the victims and honour the survivors of Srebrenica, and each event is unique to the community with whom it is held. 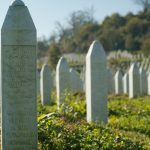 However, the content of your event is key to how it is received and remembered, and by creating the right programme your audience will be able to understand why and what we must learn from Srebrenica. Follow the links below to download our suggested materials for your Memorial Event/Activity. For all other event resources, please see this page.